During the Sunday we spent in the Napa Valley, we went to two vineyards in St. Helena--Del Dotto Vineyards and Duckhorn Vineyards. After our delightful lunch at Ubuntu (and losing track of time), we rushed over to Del Dotto Estate Winery and Caves for our 1:30 PM reservation. 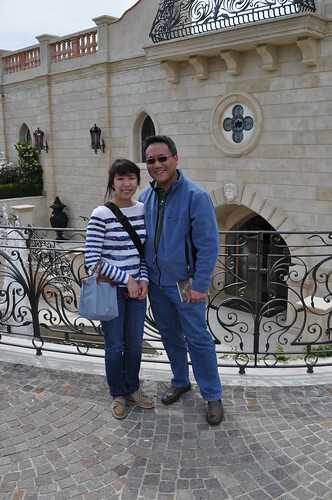 Outside the Del Dotto Vineyards Estate Winery and Caves--very reminiscent of a Venetian-style villa. 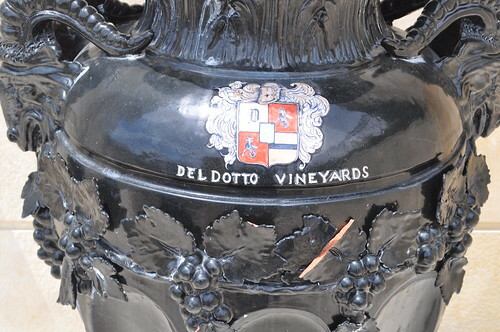 The Del Dotto family had started making red wine in the mid 1400s, when they migrated from Venice to Tuscany. Several centuries later, in the 1800s, Dominic Del Dotto moved from Tuscany to Merced, California, seeking a new life and opportunity. The family tradition of wine making continued in the Del Dotto basement, where Mr. Del Dotto kept wine barrels. 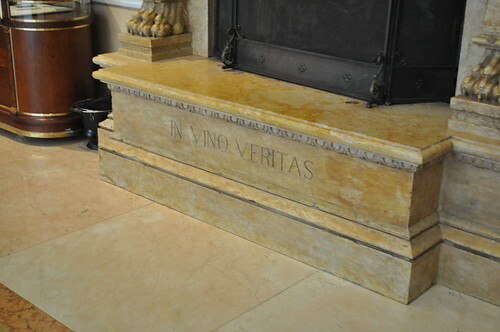 His youngest son, John, developed a love for wine as he grew older, making sure the family shared wine in the garden almost every day, along with his own son, David. This strong interest in wine was passed down to David Del Dotto, when he became an avid wine collector in the late 1980s and made a visit to the Napa Valley while on vacation. Mr. Del Dotto, his wife, and couple friends were buying wine for their personal collection when he spotted and purchased a seventeen-acre estate off Highway 29 in St. Helena--i.e., what was to become Del Dotto Vineyards. 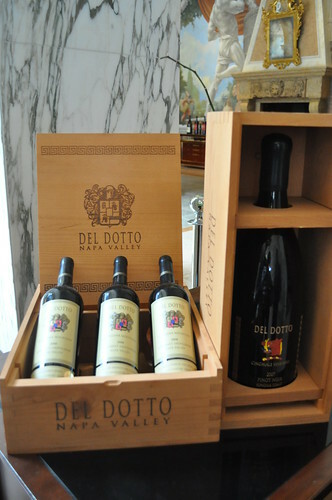 In 1990, Mr. Del Dotto planted new root stock of Cabernet Sauvignon, Cabernet Franc, Merlot, and Sangiovese. During 1993, Del Dotto Vineyards bottled its first vintage, and shortly after, Wine Spectator purchased a bottle of this vintage from a wine shop, rating it with 92 points. Subsequent vintages (1994 through 1996) all received 92 ratings from Wine Spectator as well. 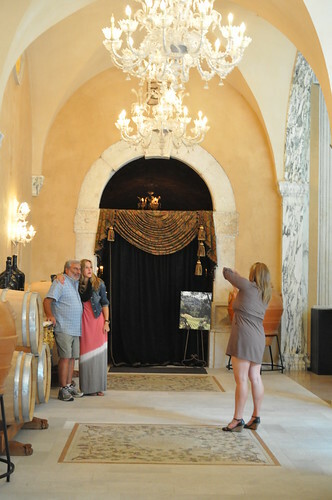 Del Dotto Vineyards found "the 'sacred caves' it now has on Atlas Peak Road in St. Helena (currently Del Dotto Vineyards Caves: Historic Winery and Tasting Room) to house its precious wines." In 2000, Del Dotto "decided to open up the ancient caves" (hand dug in 1885) for tastings to the public and host extensive barrel tasting tours to help educate wine lovers around the world about oak barrels." 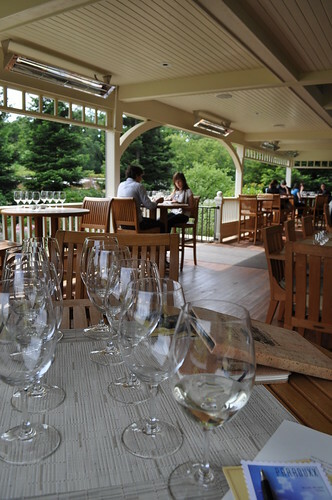 In fact, they have become the one of the only wineries to bottle wines directly out of individual oak barrels. 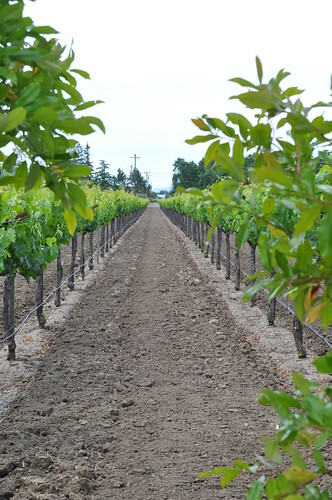 Del Dotto Vineyards has continued to be a small producer of premium wines, eventually acquiring vineyards located in Rutherford Bench, St. Helena Appellation, Howell Mountain, and Sonoma Coast. It currently makes and bottles Cabernet Sauvignon, Merlot, Cabernet Franc, Sangiovese, along with Pinot Noir from the Sonoma Coast as well as Chardonnay. 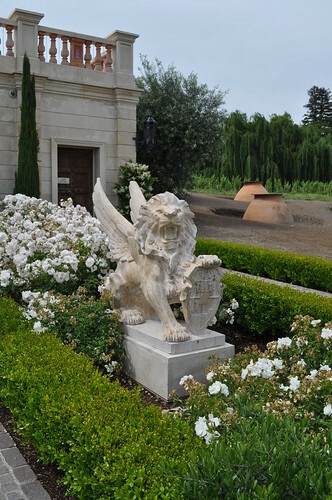 The lion sculpture outside the Del Dotto Estate Winery and Caves entrance. 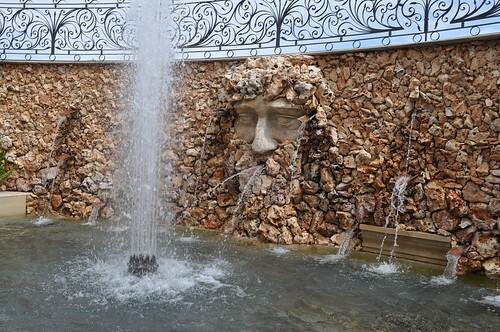 Italian-inspired stone fountain just outside the doors to Del Dotto Estate Winery and Caves! 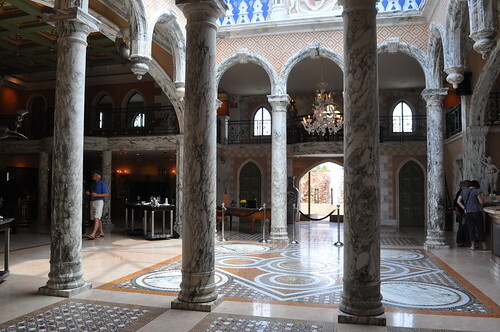 The lobby of Del Dotto Estate Winery--even the interior boasts an extravagant and ornate Venetian architecture and styles. We weren't permitted to take photos inside the cave, so I was only able to get a photograph of its entrance. After briefly discussing Del Dotto's sole use of oak barrels for aging, both French and American, our tour guide explained to us why Del Dotto's wines are very different from majority of the wines made here in the Napa Valley and why they are sold at a much higher premium. Del Dotto Vineyards use only free-run juice from its harvest grapes. Free-run juice is that which "runs freely" from a tank or vat before pressing--i.e., the juice that falls from the grape just from the weight of all the grapes on each other. As a result of solely using free-run juice, Del Dotto's wines use juice with minimal tannins (where in contrast, grape seeds and skins are typically mixed in pressed juice via a wine press). Most wineries and vineyards use a combination of the siphoned off free-run juice with pressed juice. Due to this common approach, Del Dotto's remaining pressed juice (seeds, skin, and all) are sold to other wineries. Del Dotto understands that its wines are more expensive than most wines produced in the Napa Valley, but this is primarily due to the inherently higher quality of its wine from the sole use of free-run juice. So because free-run juice comes in lower quantities than pressed juice (i.e., using grapes for its optimal juice potential via pressing), production and raw material costs (especially when the process requires more grapes than the typical wine) are bound to be higher. Our guide then led us through the cave, inside which we were able to taste wines right from the barrel! He used an apparatus called a wine thief (also known as a "barrel thief"), which is made from heavy-walled Pyrex or Kimax borosilicate tubing, with a sturdy, solid glass handle. Del Dotto's version of this apparatus is the "crooked" wine thief, in which it is fabricated to facilitate taking wine samples from tightly packed racks (in this case, barrels) that offer minimum vertical clearance. Since we tasted these wines in the dimly lit cave right from their barrels, it was hard to take accurate tasting notes other than remembering which ones struck our fancy. Most of the wines we tasted were very smooth and rich withinteresting flavors to them--you could definitely tell the wines produced by Del Dotto are of the utmost quality from the free-run juice. Bill asked our guide if he could show us the vineyards outside, so he brought us up to through the second level of the building, which led outside. Part of the Del Dotto Vineyards at the Estate Winery. After our barrel tasting, we were brought over to a table with charcuterie, cheeses, and chocolate. Our guide told he'd return shortly because he needed to check on our pizzas. Bill and Marcus thought he was kidding, but I was pretty sure he meant he'd be bringing us pizza. And low and behold, he came back with two personal pies--one plain and one sausage. There was a tasting of 2009 Pinot Noir from Cinghiale Vineyard on the Sonoma Coast as well as a port dessert wine, each going well with the pizza and chocolate, respectively. Del Dotto Vineyard wines! As its wines are a little pricier than most wines, we opted not to purchase any bottles that day, but to instead consider and think about ordering some in the future. Me and Bill outside Del Dotto. After our tour and barrel tasting at Del Dotto, we drove over to Duckhorn Vineyards for our 3 PM reservation for a tableside tasting. Entrance to Duckhorn Vineyards--housed in a beautifully constructed estate house. 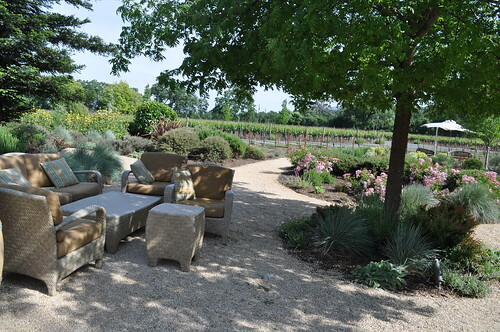 As some background, Duckhorn Vineyards was co-founded by Dan and Margaret Duckhorn in 1976, who have since crafted a "tradition of quality and excellence that continues today." 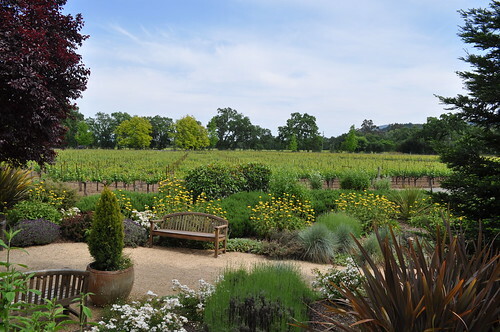 Like Swanson Vineyards, Duckhorn made the early decision to focus on the production of Merlot. While "many Napa Valley wineries were using Merlot as a blending grape in the late 70s, few were exploring the potential of this varietal as a stand-alone wine"--as such, Mr. Duckhorn felt "this elegant varietal was underappreciated in North America," resulting in Duckhorn's early production of Merlot. Duckhorn uses an "artisan's approach" to making wines--i.e., ensuring its wines reflect the "unique character and quality of each of its vineyards. The strive to understand "the needs and opportunities presented by each specific terroir and microclimate" leads to Duckhorn's goal "to harvest when the flavors have reached their peak and the tannins are their softest." Wines are barrel-aged separately by vineyard lot, using an extensive barrel program that sources several types of oaks. 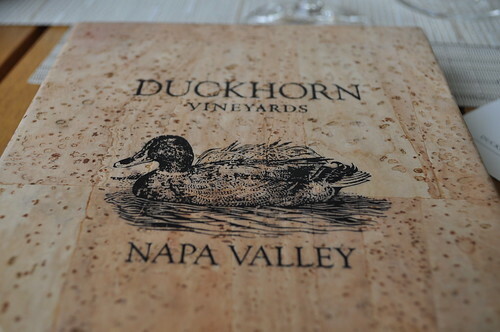 For nearly three decades, Duckhorn has remained "committed to crafting wines of distinction." Inside Duckhorn--look at all those ducks! Duckhorn Vineyards wine tasting menu made from cork! So beautiful and very peaceful. *2010 Sauvignon Blanc, Napa Valley (75% Sauvignon Blanc, 25% Semillon): I found this to be a nice summer wine--light, soft, and semi-sweet--with tastes of apple and peach. *2008 Merlot, Napa Valley (86% Merlot, 9.5% Cabernet Sauvignon, 3.5% Petit Verdot, 1% Cabernet Franc): This is the Duckhorn wine that is found in wine shops. I liked this one as well--very strong flavors of red currant. 2008 Merlot, Three Palms Vineyard, Napa Valley (79% Merlot, 17% Cabernet Sauvignon, 3% Petit Verdot, 1% Cabernet Franc -- 800 cases produced): This Merlot is in limited production and only sold through the winery. It had many red fruit flavors, but wasn't as appealing to me as the previous Merlot--this was lighter and slightly watery. It probably needed a little more decanting or aging for me to appreciate it more. 2007 Cabernet Sauvignon, Napa Valley (77% Cabernet Sauvignon, 22% Merlot, 1% Cabernet Franc): This Cabernet from the Napa Valley has hints of cherry and harsher earthy flavors on the tongue, which made me find it to be just okay. 2007 Cabernet Sauvignon, Rector Creek Vineyard, Estate Grown, Napa Valley (91% Cabernet Sauvignon, 9% Merlot): This Cabernet had flavors of dark red fruit, including black raspberry and hints of strawberry. The aroma and taste of ginger, chestnut, and cedar were also just so-so for me. *2008 "Paraduxx," Napa Valley Red Wine (68% Zinfandel, 24% Cabernet Sauvignon, 7% Merlot, 1% Cabernet Franc): This red wine blend fuses the robust flavors of Zinfandel with the grandeur of Cabernet. I like the name of the wine as it is a play on words for "a pair of ducks" (representing the pair of two wines and the pair of two actual ducks on its wine label). Each vintage celebrates with an artist-label series with a different artist's signature medium and style interpreted through a pair of ducks. 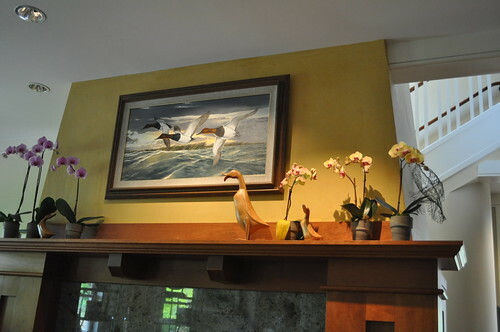 The 2008 "Paraduxx" wine label was done by Tiburon artist Barbara Banthien--a painting in acrylic of a pair of Blue Wing Teal. The blend of the two wines worked really well making it a great pairing for many foods. Marcus had many questions, particularly regarding tannins and their respective chemical composition and interaction with our taste buds. Luckily, the woman who led our tasting was very educated in the subject (in fact, she was the Head of Education at Duckhorn) and was able to answer his many questions and satisfied his curiosity on the matter. 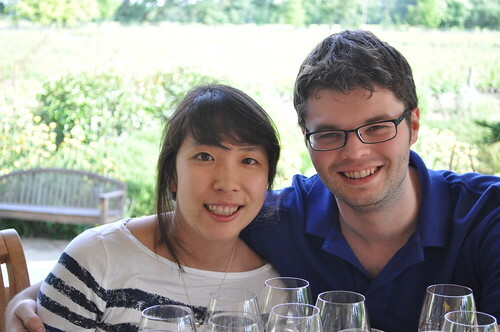 Me and Marcus at Duckhorn Vineyards. View of the vineyard, as we walked around the premises after our tasting. 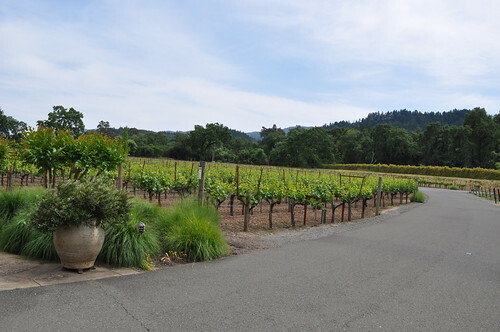 Findings: It was great to visit and see two remarkable wineries during our visit to the Napa Valley. What made it even better was how different Del Dotto Vineyards and Duckhorn Vineyards are from each other, which made the experience that much more enlightening and interesting. 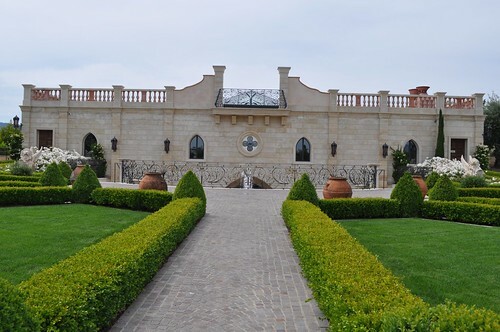 Del Dotto's elaborate grounds at its Estate Winery and Caves paired with the more modest (but by no means lacking in quality and craft) and relaxed style of Duckhorn showcased the wide range of experiences, types of wines, and tastings offered in Napa. It was very fascinating to learn about the importance of free-run juice in the process of winemaking, especially for Del Dotto, as well as taste wines straight from the barrels in its caves! 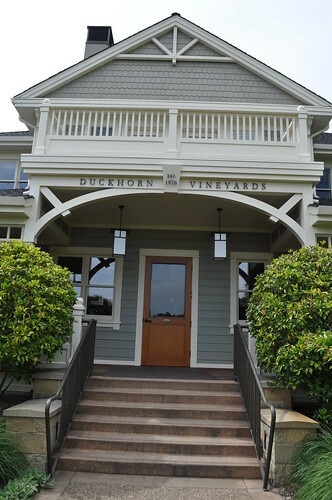 As for Duckhorn, it was so nice to be wine tasting on a table along the porch of its estate house with a direct view into its vineyard and beautiful gardens on the property. There was a nice breeze on that warm afternoon--perfect wine sipping weather! So if you're looking for the "grandest" experience in the Napa Valley, Del Dotto will be right up your alley, with its lavish estate, mysterious caves, and unique barrel tastings. If you're looking for a more laid back, relaxing experience in Napa, Duckhorn is the way to go--the service is wonderful, the atmosphere is casual and serene, and the wines are great, too. I only have great things to say about these two respectable wineries, so if you're up in Wine Country, please make it a point to stop at one of these (or even both) depending on your style! Price point: $60 per person for a cave tour and barrel tasting at Del Dotto Vineyards, $20 per person for a tableside tasting at Duckhorn Vineyards.